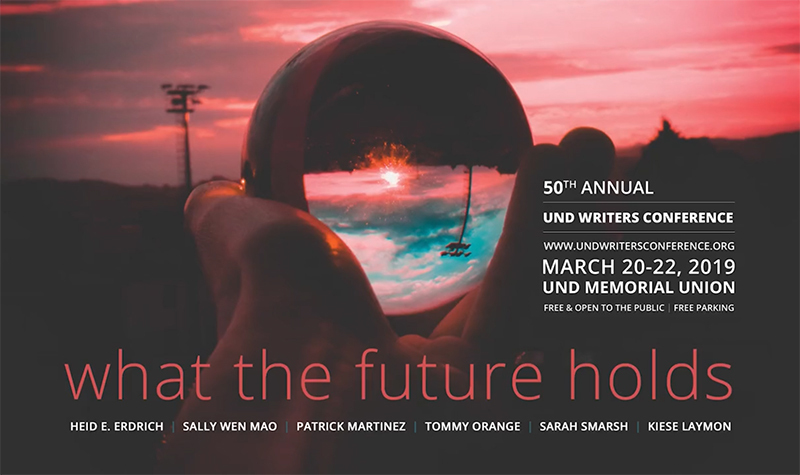 In its 50th year, the UND Writers Conference looks ahead. Some of the best up-and-coming authors in the country will be at UND to address the future of the creative economy through diverse perspectives, March 20-22. Find a complete schedule of the three-day, free-to-the-public Writers Conference here. 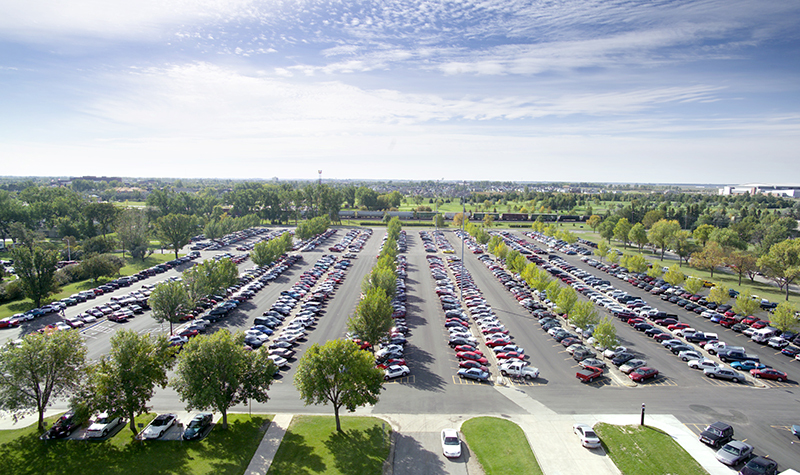 Over the past half century, art, science and culture have infused hundreds of conversations with dozens of prominent authors on the campus of the University of North Dakota thanks to the UND Writers Conference. This March, the focus shifts to what the next 50 years might bring. This is because one of the University’s marquee events, the Writers Conference, is commemorating its golden anniversary. 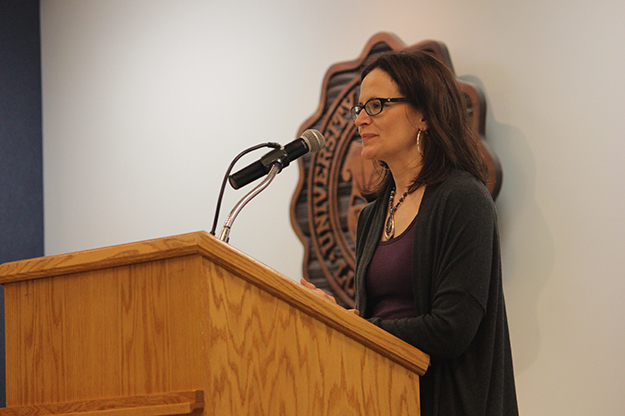 Crystal Alberts, associate professor of English and director of the UND Writers Conference, addresses the 2017 gathering of the Writers Conference on the UND campus. Photo courtesy of Sheila Liming. Five rising – although already recognizable – authors and one up-and-coming visual artist will contemplate possible answers. Representing various backgrounds, they will share their thoughts on what is ahead for the creative economy, which is increasingly seeking more diverse perspectives. 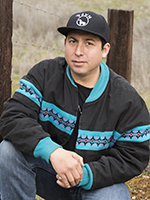 “One of the things that has been happening over the last few years is that emerging authors are frequently authors of color, which is fantastic because those voices haven’t necessarily been heard in the past,” said Alberts. 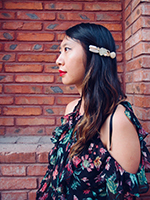 The 2019 lineup features Indigenous, Chinese-American, and Black American authors, among others, whom Alberts, planning conferences two years in advance, has followed through book reviews, awards shortlists and even Twitter. A novelist she knew she wanted to bring to Grand Forks almost immediately after delving into his debut book is Tommy Orange. An enrolled member of the Cheyenne and Arapaho Tribes of Oklahoma, Orange captivatingly depicts urban Indigenous experiences in There There. A New York Times bestseller, the novel landed on the National Book Awards roster for fiction last year. “There There has so much jangling energy and brings so much news from a distinct corner of American life that it’s a revelation,” Dwight Garner of the New York Times wrote. 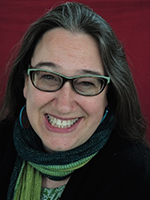 Another Indigenous author to attend this year’s conference is Heid E. Erdrich. A prolific, writer, she has penned five poetry collections and nonfiction narratives, as well as edited a couple of anthologies. Various awards – from the Minnesota State Arts Boards, the Bush Foundation and the First People’s Fund, to name a few – highlight her career. 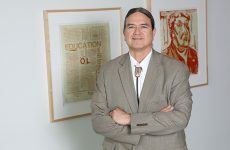 Ojibwe and an enrolled member of the Turtle Mountain Band of Chippewa, Erdrich also founded Wiigwaas Press, an Ojibwe language publisher. She also possesses a sensibility nourished on the plains – she grew up in Wahpeton, North Dakota. But Alberts also searched for another voice from the Midwest, one with distinct ties to rural America. 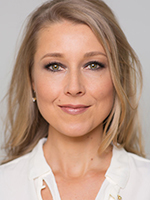 She found it in Sarah Smarsh, a Kansas-native, whose memoir Heartland: A Memoir of Working Hard and Being Broke in the Richest Country on Earth chronicles her childhood in poverty through personal tales and cultural observations. An active journalist and a commentator, Smarsh, who recently concluded a fellowship with Harvard’s Shorenstein Center on Media, Politics and Public Policy, has also written about socioeconomic struggles and divides for esteemed publications such as The Guardian, The New York Times and The New Yorker. 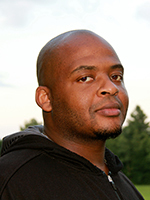 Another author with a noteworthy presence on the pages of the world’s most revered publications is Kiese Laymon. While he has already published a novel and a collection of essays, Laymon’s Heavy has been nominated for or won nearly every major literary award this season. Laymon’s memoir dissects his relationship with his mom and grandmother as well as his battle with sexual trauma, eating, and gambling, as well as what it means to be Black in the US – topics that raise conflicting emotions. “I had a strong feeling about [Kiese Laymon’s] memoir and the voice that it was going to bring, which was different from others in various ways,” said Alberts. Sally Wen Mao, one of the first authors Alberts signed for the 2019 conference, also paints a complex, fascinating world in her poetry. She won the 2016 Amy Award from Poets & Writers and a 2017 Pushcart Prize, among a number of other honors. Graywolf Press published Oculus, her latest book, this January. 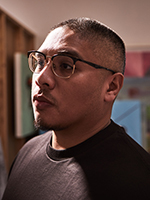 Part of an ongoing collaboration between the Writers Conference and the Department of Art & Design, Patrick Martinez, is joining the quintet of authors. Martinez’s paintings, collages and installations comment on the cultural fabric of Los Angeles, shedding light on the forgotten, hidden and dark sides. Martinez opened his first solo exhibit in New York City in early March. With the 2019 Writers Conference beginning tomorrow, Alberts has already received positive feedback.